It is a truth under-acknowledged that a drug user denied possession of their poison is in want of an alternative. The current 'explosion' in varied and easily-accessible 'legal highs' (also know as 'new psychoactive substances') are a clear example of this. In June 2008 33 tonnes of sassafras oil - a key ingredient in the production of MDMA - were seized in Cambodia; enough to produce an estimated 245 million ecstasy tablets. 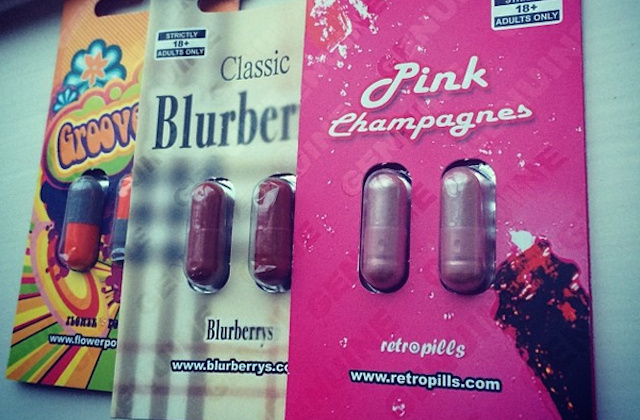 The following year real ecstasy pills 'almost vanished' from Britain's clubs. At the same time the purity of street cocaine had also been steadily falling, from over 60% in 2002 to 22% in 2009. Enter mephedrone: a legal high with similar effects to MDMA but readily available and for less than a quarter of the price. As the quality of ecstasy plummeted (as shown by the blue line on this graph) and substituted with things like piperazines, (the orange line) mephedrone usage soared (purple line). The 2010 (self-selecting, online) Global Drug Survey found that 51% of regular clubbers had used mephedrone that year, and official figures from the 2010/11 British Crime Survey estimate that around 4.4% 16 to 24 year olds had tried it in the past year. Similarly, law changes and clampdowns in India resulted in a UK ketamine drought, leading to dabblers (both knowingly and unknowingly) taking things like (the once legal, now Class B) methoxetamine. And indeed, the majority of legal highs on offer are 'synthetic cannabinoids' which claim to mimic the effect of cannabis. In all, it's fairly safe to claim that were recreational drugs like ecstasy, cannabis and cocaine not so stringently prohibited, these 'legal highs' (about which we know very little) probably wouldn't be knocking about. Still, governments tend to be of the view that any use of drugs is simply objectively bad, so the above is rather a moot point. But what anxious states can do, of course, is ban new legal highs as they crop up. However, even this apparently obvious solution has a few problems— the first being that there seems to be a near-limitless supply of cheap, experimental compounds to bring to market. When mephedrone was made a Class B controlled substance in 2010, alternative legal highs such NRG-1 and 'Benzo Fury' started to appear. In fact, over 550 NPS have been controlled since 2009. Generally less is known about each concoction than the last, presenting potentially far greater health risks to users. At the same time, restricting a drug under the Misuse of Drugs Act 1971 requires evidence of the harm they cause (not that harm levels always bear much relation to a drug's legality), demanding actual research as opposed to sensationalist headlines. Even though temporary class drug orders were introduced in 2011 to speed up the process, a full-out ban still requires study, time and resources. Many have claimed the battle with the chemists in China is one lawmakers are unlikely to win. And so with all of this in mind, the Queen's Speech on Wednesday confirmed that Conservatives will take the next rational step in drug enforcement, namely, to simply ban ALL OF THE THINGS. In order to automatically outlaw anything which can make people's heads go a bit funny, their proposed blanket ban (modelled on a similar Irish policy) will prohibit the trade of 'any substance intended for human consumption that is capable of producing a psychoactive effect', and will carry up to a 7-year prison sentence. Somewhat ironically for a party so concerned with preserving the UK's legal identity it wants to replace the Human Rights Act with a British Bill of Rights, this represents a break from centuries of British common law, under which we are free to do something unless the law expressly forbids it. This law enshrines the opposite. In fact, so heavy-handed and far-reaching is the definition of what it is prohibited to supply that special exemptions have to be granted for those everyday psychoactive drugs like caffeine, alcohol and tobacco. Whilst on first glance the ban might sound like sensible-enough tinkering at the edges of our already nonsensical drug policy, it really is rather sinister, setting a worrying precedent for the state to bestow upon citizens permission to behave in certain ways. This law will probably (at least initially) wipe out the high street 'head shops' which the Daily Mail and Centre for Social Justice are so concerned about. However, banning something has never yet simply made a drug disappear. An expert panel commissioned by the government to investigate legal highs acknowledged that a 50% increase in seizures of Class B drugs between 2011/12 and 2013/14 was driven by the continued sale of mephedrone and other once-legal highs like it. Usage has fallen from pre-ban levels, but so has its purity whilst the street price has doubled. Perhaps the most damning evidence, however, comes from the Home Office's own report into different national drug control strategies, which failed to find “any obvious relationship between the toughness of a country’s enforcement against drug possession, and levels of drug use in that country”. The best that can be hoped for with this ridiculous plan is that with the banning of absolutely everything, dealers stick to pushing the tried and tested (and what seems to be safer) stuff. Sadly, this doesn't seem to be the case - mephedrone and and other legal and once-legal highs have been turning up in batches of drugs like MDMA and cocaine as adulterants, and even being passed off as the real things. Funnily enough, the best chance of new psychoactive substances disappearing from use comes from a resurgence of super-strong ecstasy, thanks to the discovery of a way to make MDMA using less heavily-controlled ingredients.